A free guide to the different types of pasta you can cook/eat. Pasta is a favourite type of food for millions of people all over the world. Many pasta dishes can be easy to cook and can make great family meals. 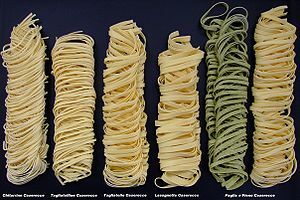 However many people do not realise is that there are actually lots different types of pasta. Let’s take a look. Fresh pasta can be found in almost every supermarket these days, and a lot of people prefer to cook with this kind of pasta. Many people will actually make their own fresh pasta at home and use that for whatever dish that they are cooking. The good thing about fresh pasta is that it is very easy to work with and only takes minutes to cook through. Of course, fresh pasta does not have a very long shelf life in comparison to dried pasta. Dried pasta is the most commonly used forms of pasta in households today. Obviously, the main reason for this is that dried pasta will last a lot longer than fresh pasta. The other good thing about dried pasta is that you can get virtually every kind of pasta in a dried version. The only real downside to this type of pasta is that it takes longer to cook, depending on the type in question. Long form pasta noodles are usually made by extrusion or by a process of rolling and cutting. One of the most popular types of pasta: spaghetti is a type of long form pasta. Spaghetti pasta is very commonly used in dishes such as Spaghetti Bolognese; a favourite in a lot of households. There are also many other forms of long pasta. For example, Tagliatelle is another common type of long pasta. This type is typically used in Carbonara dishes. Ribbon cut pasta/noodles are rolled flat then cut, either by hand or using a machine. Sort form pasta is probably the most commonly used type of pasta in the United Kingdom. This type of pasta comes in many different shapes and sizes, and it can be used in a wide range of dishes. The term ‘Shaped Pasta’ covers a very wide range of different types of pasta. However, more often than not, the majority of us will use some form of shaped pasta with our pasta dishes. For example, twisted pasta shapes are very commonly used. Another popular style is pasta shells, of which there are many different types. These days you can even get special fun shaped pasta that is designed to encourage kids to eat it. These shapes will usually be of their favourite cartoon character or similar. If you are planning on making your own fresh pasta then you can make it into absolutely any shape that you fancy. There really are no limits. Stuffed pasta is another highly popular type. The good thing about stuffed pasta is that you do not have to add anything to it if you do not want to, as you can just have the pasta as a meal on its own. There are many different fillings that can be found in stuffed pasta. Some are meat based, though there of course many different vegetarian options available as well, such mozzarella cheese or ricotta. If you are making the pasta from scratch then you can put whatever you want inside as a filling. Lasagne sheets are used to make the very popular Italian dish lasagne. There are a lot of different variations of this type of pastas, but the most commonly used is the dried form. These sheets are simply placed within the layers of the lasagne and cooked in the oven. This is a very popular dish, and very easy to make as well. 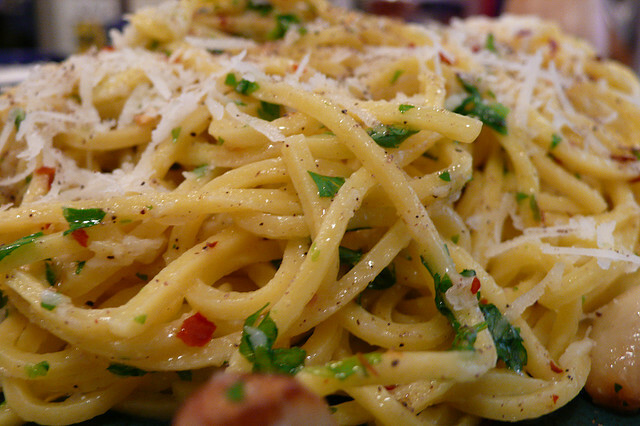 The types of pasta mentioned above hardly scratch the surface. There are hundreds of different types, it just takes some time to figure out which types you like cooking with, and which types you don’t! How to make fresh pasta. Making the pasta dough. How to prepare fresh pasta. How pasta is made. A video about the mass production of pasta.